The “Training and Capacity Building” WP of the ENERI project organized a Research Integrity Boot Camp April 9-10, 2018. 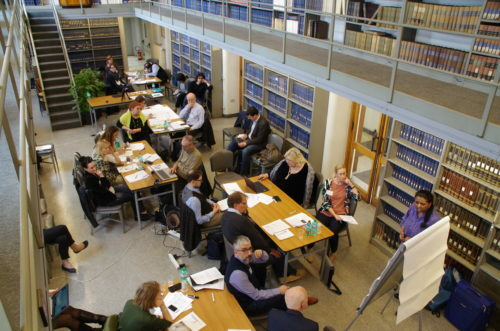 The venue for the boot camp was conveniently the National Research Council (NCR) in Rome, which also hosted the ENRIO meeting following the boot camp. The boot camp took its inspiration from a similar concept in the U.S., namely the U.S. RIO Boot Camp in which a chosen case is exercised from a variety of perspectives in a collegially facilitated workshop over a few intensive days. The participants of the boot camp were 21 members of ENRIO. 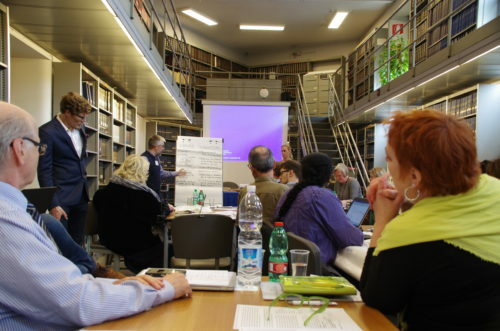 The facilitators were individuals working in ENERI: Asta Cekanauskaite and Vilma Lukaseviciene of Vilnius University, David Shaw and David Townend of Maastricht University, and Simo Kyllönen and Erika Löfström of the University of Helsinki. The facilitators are associated with the WPs on training and creating the ENERI manual on research ethics and integrity. This collaboration made use of the conceptions of training and the contents of the manual developed in respective WPs of the project. The boot camp focused on the themes of misconduct and the ALLEA Code of Conduct, conflict of interest, authorship and plagiarism, the GDPR, building a culture of integrity, and ethics review in non-medical fields. All sessions involved discussion around cases. Unlike in a U.S. boot camp we did exercised one case more thoroughly but also had a number of other cases to assure sufficient breath in the discussions. While this was a boot camp with an integrity focus, its’ ambition, in line with the ENERI project, was also to highlight overlapping issues between research ethics and integrity. The group of participants was highly heterogeneous in terms of the guidelines and procedures followed in their respective contexts, legislation and mandates, and thus, finding a way to work towards a uniform solution was practically impossible. This, however, did not hinder lively debate around the cases! For example, in one of the sessions, namely on building a culture of integrity, participants discussed features that may make a research community vulnerable for misconduct. The groups identified a multitude of factors demonstrating the complexity and systemic nature of vulnerabilities to misconduct. For instance, on both the individual and organizational levels there may be pressure to pursue impact and to engage in a “race to fame”. In general, the groups discussed problems associated with highly competitive environments in which there is not tolerance for trial, error and failure. Further, the groups acknowledged that leadership that does not take sufficient responsibility for the implementation of values around integrity makes an organization vulnerable. On an organizational level, a lack of independent bodies in the integrity infrastructures may escalate the risk further. The role of factors outside the research community, such as media in bringing attention to problems, on the one hand, but also escalating events on the other hand, were discussed. Turning focus towards possible solutions to mitigate vulnerabilities, the groups highlighted the existence of proper guidelines and procedures and the necessity to ensure their implementation on all levels in an organization. Guidelines and procedures are not sufficient, if there are not features in the environment reinforcing these. Other solutions discussed were whistleblower protection, a re-evaluation of the mechanisms for promotion and compensation, including the idea of “slow science” as opposed to the ever-increasing race for the top, a rethink of the concept of “failure”, focus on career structures and the role of training. The session serves to highlight that despite much heterogeneity in contexts and guidelines, the participants also identified common solutions at different systemic levels. Another boot camp with a focus on research ethics will be organized within the ENERI project in the beginning of 2019. Based on these first experiences from Rome, the concept will be further refined and contents will be adapted for a research ethics associated audience. The ENERI project received H2020-funding between 2016-2019.